A back-up generator is one of the best investments for your home. If you own a home and you want peace of mind then a whole house generator is an absolutely essential piece of equipment that will enable you to keep your power on even when the power goes out in your neighborhood. Most people don’t plan for emergencies because they consider it a waste to spend money on something they don’t need immediately. Well, when disaster strikes, you’ll wish you had spent the money to keep your refrigerator on, the lights illuminated, and the heater running. A portable generator is not the same as a whole house generator; many people confuse the two. Other terms people substitute for whole house generator are: back-up generator, residential generator, stand-by generator, home (or house) generator. I wish everyone could agree on one term. I just want to make it clear that a portable generator is designed to power a few devices at a time, not power your entire home. Designed to work with temperatures as low as -22 degrees Fahrenheit. The mindset you need to have when purchasing a whole house generator is one rooted in the future. Ask yourself : What type of generator do I need for the long-term? How much power do I need? How often will I need it? What’s my budget? A back-up generator is an investment. Power outages typically don’t last very long but did you know that food in a refrigerator will spoil in about 4 hours after the power goes out? Do you live in an area prone to earthquakes like Los Angeles or Seattle? Do you live in a hurricane prone region of the USA? Tornado alley? If a major disaster strikes your hometown, like an earthquake, you could be without power for weeks. Imagine how smart you’ll feel if you take proactive measures now and invest in a whole house generator. Your neighbors will think you’re a genius, and they will probably be asking you “what’s for breakfast, lunch and dinner?” — doing their best to befriend you. Nobody wants to think about disasters, nor do we want to spend money needlessly, but having a back-up generator in place is a must, in my opinion. In fact, I don’t know why all homes built today don’t have them. It should be common practice. When the power goes out your home back-up generator will automatically turn on, and power your entire home. Simple and worth every penny. Unfortunately, too many people wait for a major disaster before waking up and taking action. By then, it’s too late. Good luck even trying to find a portable generator during a disaster. When the Japan 9.0 earthquake occurred in 2011 it was a wake-up call to me, so I decided to purchase an earthquake kit. You see, I live in Vancouver BC and we’re long overdue for a major earthquake. Problem was, everyone wanted earthquake kits at the same time, so I had to wait about 5 weeks until I could get one. There was a waiting list. I simply want to stress that it’s easy to talk yourself out of purchasing a whole house generator but the day will come when the power will go out. It’s inevitable, and I suppose you need to ask yourself if it’s worth the risk of doing nothing. Can you accept the consequences of being without power for a couple weeks? Consider where you live and the type of natural disasters your region is prone to, then make your decision. In 2014, the average annual electricity consumption for a U.S. residential utility customer was 10,932 kilowatt hours (kWh), an average of 911 kWh per month. Louisiana had the highest annual consumption at 15,497 kWh per residential customer, and Hawaii had the lowest at 6,077 kWh per residential customer. This article will cover a wide range of topics and help you decide which home stand-by generator is best for you. We show you several excellent back-up generators to consider. We hope you find this whole house generator buying guide helpful. Blackouts are something that everyone has to face and it doesn’t matter which part of the world you come from. Everyone, everywhere will find that there are times when your electricity will fail you. What differs from state to state and country to country is the amount of time you have to endure without electricity. Another factor is the frequency at which the blackouts occur. Those who don’t face frequent blackouts will not know the pain of those who do. But irrespective of how often you find yourself in darkness, all of us will testify that we don’t like it. That is the main reason why we look for a Plan B. The best Plan B is to get a whole house generator. Why is having a generator so important? A generator helps in a number of ways. The most obvious one is that it keeps you out of the dark. This means that you don’t have to rely on lanterns and candles to make your way around the house. It also means that you can have your air conditioner running if your power goes out during a heat wave, and your food in the refrigerator won’t spoil. So in a way, having a whole house generator means that you can continue to live your normal life even if your neighborhood is in the dark. A home generator can power your entire home, including critical hard-wired systems like AC, heat, sump pumps, well pumps, security systems and major appliances. No need to refuel as they can run off of your homes natural or propane (LPG) gas lines. Another factor that most of us do not consider is food. Most of us have a large store of food in our refrigerators and freezers. A blackout starts a ticking clock for any food we have in our fridge or freezer, because in about 4 hours it will spoil. It doesn’t take long for a power outage to put our life in complete disarray. A home generator ensures that the provisions don’t go to waste. It’s also important to note that most of our meals these days require some sort of heating or cooking appliance, so — microwaves, stoves, kettles, coffee machines…they all run on electricity. A blackout means that these basic appliances also cease to function. This is another important way in which the whole house generator helps us during a blackout — a generator will help us eat. Communication — Internet, smartphone chargers, TV, radio, etc. Ability to charge power tools for use during the emergency and post-outage cleanup. Standby generators have gained popularity because they seem like visions of light in our darkness. Unlike portable generators, these whole house generators are permanent fixtures in the yard. All you need is a concrete pad for it to be placed on. What is the specialty of these house generators? They provide uninterrupted power backup which can last for days. This is simply because they are connected directly to the electric panel in your house. So you don’t have to do anything. Everything is all set up. When the power goes out your backup generator will turn on. The whole house generators function on external fuel. Some common sources are liquid gas, propane and diesel. These standby generators are larger than the usual portable generators. The smallest ones are however just marginally bigger but there is a big difference in the output that both types of generators provide. So, how does a whole house generator work? Everything about the standby generator revolves around one particular switch. This is called the automatic transfer switch. So what does this particular switch do? The automatic transfer switch ensures that the house is disconnected from your utility before the generator comes on. How does it help? Well, the switch ensures that you don’t have to manually turn the generator on. When it senses that there is an interruption in your power service, it turns the generator on. What about the machinery? How does that work? The standby generator has an internal combustion engine. This is the place where the main workings of the generator take place. The engine functions on fuel. This fuel is usually natural gas and/or liquid propane. Diesel generators are typically used for industrial applications. How do you turn off the generator once the power supply starts again? You don’t have to do anything. The automatic transfer switch shuts down the generator and the original circuit of power usage is restored. Thanks to the internet calculating your power needs is easy to do using online generator sizing calculators from any of the major generator manufacturers (see below). Online calculators help you understand how much power you actually need versus how much power you think you need. Most people underestimate the amount of power required for their home. It’s always better to have more power than you need rather than not enough. This reduces the burden on the generator and allows it to run more efficiently, as opposed to having it run at maximum capacity non-stop during an emergency situation. Many people will find that a large generator like a 22,000 watts one is really not required, well, it really depends on the size of your home and the equipment you need to power. Use the online calculators listed above to make the right decision. It depends on personal needs and on your budget. Your financial ability is a very important factor. Why? Simply because whole house generators can be very costly. The cost of buying a whole house generator is higher than that of a portable generator. You also need to keep in mind that you have to spend a nice tidy sum for the fuel it consumes. The greater the power a home generator produces, the more fuel you are going to need. Having said that, I will advise to save your money for a little longer and buy the generator you really need rather than the one you can afford in that moment in time. Don’t waste your money by buying a generator that won’t meet your power requirements. So what do people do when faced with such a dilemma? The easiest way to go around it is to compromise. Most people choose to ignore the low and high ranges and focus on the middle range of whole house generators. Now these home generators usually fall in the range of 4000-9000 watts. What can a home generator of 4000-9000 watts do? It can help power up at least three major appliances. In addition to this you will also have light. A few basic utilities can also run on such a generator. Bigger generators however allow you to keep the heating system running. It also ensures that other important devices can be used simultaneously. Another factor that you need to consider is that the higher the number of watts the home generator provides, the bigger the generator is going to be. Usually this also translates into an increased noise level too. So space and noise should also be factors that you need to consider. While the noise may not really bother you, you need to ensure that you do not break any of the housing rules. Many neighbors don’t appreciate the constant sound that home generators produce. Don’t do the installation yourself. Period! Kohler strongly recommends that only factory authorized distributors or dealers install and service the generator. Have the generator set installed by an authorized distributor/dealer or service technician. Refer to the Installation Manual for installation instructions. There are two main reasons why you should hire a certified technician. First, for your own safety. Your dealing with electricity that runs through your entire house. You don’t want to jeopardize your personal safety, or the safety of your family. It’s not worth it in any way. Don’t try. Spend the money. And second, if you install it yourself and your home generator malfunctions or breaks down, you probably won’t be covered because you will void the warranty by doing it yourself. Pay a professional who is certified. Check with the manufacturer to find the right person in your area. From the start itself, almost everyone will tell you that this is not a job that you should try to undertake on your own. While it may seem like a relatively easy project, this is a job for an expert. A little logic will help you understand why. One of the ways to get your generator going is to connect it to the local natural gas system. It may sound easy enough but it is more complex than that. Many of the whole house generators require the gas inflow to be at a certain pressure. Most of them require pressure of around five to seven inches of water. Now most cities and towns supply the natural gas at a much lower pressure. There is nothing that you as a person can do to change this setting. The setting has to be changed by the supplier. So tinkering around may actually cause damage as you may not know how to gauge if the pressure is right or not. If you do manage to set it up and the pressure is lower than the whole house generator requirements, you risk damaging the entire system. This is possibly because the amount of fuel required is not being supplied at the rate that the whole house generator requires. The combustion that takes place in the engine in turn is inefficient and this puts a strain on the home generator as it cannot keep up with the demands placed on it! The whole process of setting up a whole house generator is a complex one. It involves a lot of technical know-how and a lot of skill. The device in itself is large and is difficult to carry. Not only do you need to have advanced electrical and plumbing skills, installation of a home generator requires permits. Inspection of the premises needs to be done after the installation is complete. Carbon monoxide is a poisonous gas present in exhaust gases, and it can kill you. Make sure you have a carbon monoxide (CO) detector installed. A professional will ensure that the exhaust system is leak-proof and it should be routinely inspected. Carbon monoxide poisoning can cause a wide range of symptoms, and can kill you if you are subjected to it for too long. Many people needlessly die in their sleep because they didn’t bother to install a CO detector. Unlike other poisonous gases, you cannot smell carbon monoxide. It’s odorless. Common Symptoms: headache, dizziness, weakness, upset stomach, vomiting, chest pain, and confusion. CO symptoms often make people feel as though they have the flu. But, in this case, the “flu symptoms” will come on suddenly. If you feel any of these symptoms, go outside immediately and get fresh air — then call 911. Learn more by reading our comprehensive article on carbon monoxide. Not many people consider keeping the generators within their house. In fact, it is not recommended. The primary reason why it isn’t advised is because of safety. A building needs to be designed in such a way that it can handle a generator inside. This means that there needs to be adequate amount of ventilation. This is needed for multiple reasons. A lot of heat is produced. This heat needs to escape or you face fire risks. The generator itself needs adequate airflow to help it cool down. Another consideration is the engine exhaust piping. If this piping isn’t fitted well, there is the possibility of carbon monoxide leaking. We all know that Carbon monoxide is a harmful gas and we know the repercussions that this kind of incident can mean to our health. As stated before, installing an indoor home generator is a fire hazard. So before you decide to make the preparations required to install one, contact your fire insurance provider. Many do not permit the installation of indoor home generators. Due to the number of things that can go wrong, installing an indoor generator is a dicey move. It requires a lot of work both pre and post installation. Even if your whole house generator is perfectly installed, you will find that the reoccurring costs are very high. Indoor home generators require frequent inspection and maintenance. This is one of the reasons why the maintenance costs are higher than outdoor home generators. These generators do not pose as big a fire and health hazard as indoor home generators. They however are exposed to the harsh weather conditions. To combat this most outdoor home generators are housed in weather protective enclosures. Installing an outdoor home generator means that you need to look for two things, an electricity source and the fuel lines. Once you find a spot that has both then you are all set to start. Another point that you should keep in mind is the three feet rule. This rule means that there should be at least three feet distance between the generator and other surrounding objects. You should also ensure that the exhaust does not point in the direction of any open windows or doors. Otherwise you will only be accumulating noxious fumes inside the residential area. When choosing the spot to set up the whole house generator, it is wise to ask for an expert’s opinion. Now that we have got a general idea about how the Whole house generators function, let us take a look at some very popular home generators on the market. Although a transfer switch is very complicated device, all you really need to know as a homeowner is that when the power goes out, the transfer switch detects the outage and automatically switches your power to use the stand-by generator to power your home. There are many different options that come with transfer switches, and we will add more details for this section shortly. For now, let’s get the whole house generators reviews. Kohler has been known for it’s whole house generators for a really long time. They are also known for the fact that they keep striving to improve their generators. This can be seen by looking at every new model that they introduce. The Kohler 20RESAL- 200SELS is just one such model. Let’s look at a few features that Kohler has added in this model. This model is advertised with the tag line of high quality power. What Kohler has provided here is advanced voltage and frequency regulation. This helps to protect your appliances by providing a high quality of power. This is a 20,000 watt (20 kW) home generator that uses an air cooling system. The measurements of the Kohler 20RESAL-200SELS are 48 inches by 26.2 inches by 29 inches. Kohler puts it’s money on this product. They say that the Kohler 20RESAL-200SELS is highly reliable. Kohler even backs up it’s claim of high reliability with a 2000 hour or a five year warranty. It comes with a corrosion proof design. This model is designed to tackle even the harsh seaside elements. The Kohler 20RESAL-200SELS promises to power up your house quickly and quietly. An interesting feature is the two line LCD display. The display is easy to read in all kinds of light conditions. This means that you won’t have to squint in the sunlight nor carry a torch in the night! Another great feature is the incorporation of the hydraulic valve lifters. What does that mean to a lay person? It means that the performance will not be interrupted by routine valve adjustments. That in turn means uninterrupted power supply! The model comes with both 100amp and 200 amp Model RXT fuses. This means you can select whatever suits your requirement. It is important to note that the Kohler 20RESAL-200SELS runs on natural gas or on LPG. A very important feature that we need to look at is the alternator switch. Kohler uses a well ventilated and drip proof construction for the alternator. It is a two pole rotating field kind of alternator switch. It is a 200 amp model and the voltage specifications is 240 volts. There are a lot of technical details to sort through if you’re interested in learning more about it. Thankfully, KOHLER has created a comprehensive specifications brochure, which I recommend you look at before you decide to buy it. View or download the SPECS DOCUMENT. View or download DIMENSIONAL DRAWINGS. Heavy-duty, commercial-grade engine that stands up to extreme weather. Fast: In under 10 seconds, this home generator automatically restores power to a 60,000 BTU air conditioner, major appliances and electronics. Warranty: 5-year, 2,000-hour protection, and a corrosion-proof enclosure that’s built to last. High-Quality: In 2010 KOHLER generators received an MVP award Most Valuable Product by Building Products Digest (magazine). Patented Technology: PowerBoost supplies power to start demanding appliances, like your central air conditioners, without ever reducing power to other electrical equipment. Designed to keep everything running smoothly. Provides quality digital voltage and frequency regulation along with low levels of harmonic distortion to protect sensitive electronics, like computers. Optional: Works with OnCue Plus and OnCue Plus Wireless Generator Management Systems, and Programmable Interface Module (PIM). DC2 controller designed for today’s sophisticated electronics manages both the generator set and Model RXT transfer switch functions. Stylish corrosion-proof enclosure impact tested to -30°F. Runs on either natural gas or liquid propane (LPG) with an easy to swap between natural gas and propane. Also compatible with Load Control Module (LCM) or Load Shed kit (with single-phase generators). Powered by the KOHLER Command PRO engine, engineered for challenging commercial applications. When the power goes out and all you have left is a backup generator to depend on, you want to make sure that it’s been designed in extreme conditions. Thankfully, KOHLER tests its generators thoroughly, under a wide range of circumstances and loads in order to manufacture one of the best stand-by generators money can buy. Your neighbors won’t notice when the generator is working because it’s reasonably quiet. It’s neighborhood-friendly and KOHLER compares the noise volume as being the equivalent of running a typical central air conditioner. As quiet as a normal conversation thanks to smart engineering. Quietest in class. Comparable to normal conversation. The Champion series is another group of home generators that is frequently looked at. This is probably because of their high standard of quality and their constant good performance. The Champion 100177 is a great model to look at. Let’s see why. This whole house generator can provide 8.5kW of continuous electrical power. What does that mean for us? It means that this device can help power up most of the essential devices in your home. This can even include refrigerators and televisions! In fact, the Champion 100177 can also power up your heating devices and ACs. This makes it the perfect choice in cold weather conditions. It comes equipped with a 439cc Champion OHV engine. This is what helps cater to your power needs. It even has an electric start and a low oil shut down function. This makes sure that you don’t have to do a lot of manual work. The Champion 100177 has an automatic 50 amp indoor transfer switch. This helps in starting the home generator automatically. The Champion 100177 is housed on a composite mounting pad and is enclosed in an all weather steel enclosure. This helps ensure that the device is not exposed to the surrounding weather conditions. It also means that the amount of damage that the harsh weather conditions can cause is significantly reduced. This particular home generator functions on a Natural gas or Propane operation. The Champion 100177 has a 24 volt starting system which can help start up the generator even at temperatures as low as -22 degrees Fahrenheit! The noise levels of this generator can be compared to noise levels of a normal conversation. This makes the Champion 100177 a really quiet buy! Natural gas (NG) or Propane (LPG) operation. 24 volt starting system is the most powerful in the industry. Designed to assure starting at temperatures as low as -22° Fahrenheit. This device is capable of powering your home by using the 12.5kW continuous power that it generates. Like the Champion 100177, this device can power up most of the devices in your home. Like the Champion 100177, the Champion 100176 has an electric start and low oil shutdown system. It’s engine however is different. The Champion 100176 is a 717cc Champion OHV engine and this is what helps this whole house generator provide that extra power. The Champion 100176 has an all weather composite mounting pad and an all weather steel enclosure to protect it against the changes in weather. This device functions by using either Propane or Natural gas. The Champion 100176 has an interesting pressurized oiling system. This helps the engine function smoothly in all kinds of conditions. Like the Champion 100177, the Champion 100176 comes equipped with a 24 volt starting system. This is especially useful in very cold climates. The starting system enables the home generator to start up even in temperatures as low as minus 22 degree Fahrenheit. Includes a NEMA 3 outdoor transfer switch. This whole house generator is equipped with a 717cc Champion OHV engine. Like the others, this also has an electric start. It also comes with a low oil pressure shut down. This makes sure that there is no damage that occurs to the engine when the oil levels fall to a critical level. The automatic transfer switch is a 99 amp, 12 circuit transfer switch. Like the others, the Champion 100179 is mounted on an all weather composite mounting pad and is enclosed in an all weather steel enclosure. This protects it from the external elements that could damage the home generator. All the other features of this device are similar to the Champion 100176. The only difference is that this home generator has an outdoor automatic transfer switch. Learn more about this series by visiting the Champion Power Equipment site. Has a remote monitoring system so you can check the status any time. View or download the SPEC SHEET for the Generac 6438. The Generac whole house generators are very popular among homeowners. Let us take a look at what makes them so special. The Generac 6438 has a great power quality with less than 5 percent total harmonic distortion. Sounds complex? In simple words, the Generac 6438 provides clean and smooth operation of all your electronic devices in your house. The controller is multilingual and has a two line LCD display. The display is even color coded which makes understanding its functions so much easier! This device can provide 11kW of uninterrupted power. It operates by using Natural gas as a fuel. The beauty about this device is that it only needs a pressure of 3.5 inches of water to function. The Generac 6438 is protected from the harsh weather conditions by a durable powder coat finish. In addition to this, it also has a air-cooled steel enclosure which makes this a really sturdy buy. Not only is the Generac 6438 able to withstand harsh weather, it is also able to withstand winds of up to 150mph. This makes the Generac 6438 a pretty cool device to have! 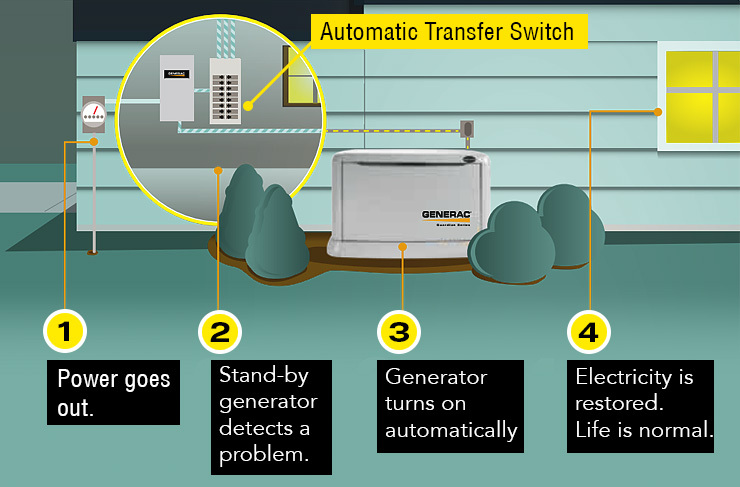 This generator is paired with the Generac Smart power transfer switch. It helps to shed the non essential circuits so that the home generator is not overloaded. Enclosure is made from automotive-grade Galvanneal steel to resist rust. Manages Power to All of Your Appliances, Managed Whole House Power system powers your household appliances plus up to 2 air conditioners. Quick Response, Automatically powers your home in seconds after sensing a power outage. Flexible Placement, Tested against tough NFPA standards, unit can be placed as close as 18″ from home, providing more placement options in your yard. Transfer Switch Included, Flexible, indoor or outdoor, weather-resistant transfer switch placement make it convenient to install. Four Year Limited Warranty consisting of parts and labor for all 4 years, we stand behind our warranty and make it easy for our customers. This is another very interesting generator. The Briggs and Straton 40346 is a 20kW generator and has a few noteworthy features. The Briggs and Stratton 40346 functions by using Propane or Natural gas as it’s primary fuel. It is a fully automatic device and has a 993cc Briggs and Stratton Vanguard V twin engine. This helps the home generator produce the required amount of power. One noteworthy fact about these generators is the fact that they can be placed very close to the house. The distance required to be kept as low as 18-inches, making this a great device for those with space constraints! The Briggs and Stratton generators come with a variety of different kinds of automatic transfer switches. You can choose one based on your requirements. Includes (Briggs and Stratton 40346): 20,000-watt Standby generator; 200 amp automatic transfer switch; patented A/C power control module to power up to two load-dependent air conditioners; installation base; battery charger; and hour meter. View or download the BROCHURE for the Briggs & Stratton 40346. Choosing a whole house generator is a really big decision. It involves a lot of consideration and a lot of research. This is especially important as the initial cost of buying a home generator is very high. The recurring cost of maintaining a home generator can also become a burden. Space constrains can also be an issue. That is why it is important to make a list of all the constraints that you may face. With that done it is easy to start eliminating all the models that do not suit your requirements. Once you have narrowed your list down to a few, then all that is left is to check the reviews and see which one you like best! A whole house generator provides a home with a lot of comforts that you would miss in a blackout. Buying one could possibly be the best decision you make! View or download the SPEC SHEET for the Generac 6551 whole house generator. View or download the GENERAC GENERATOR BUYING GUIDE. Included 200 Amp transfer switch (PDF Spec Sheet). Generator exhaust contains carbon monoxide, a colorless, odorless, poisonous gas. Breathing carbon monoxide can kill you if you expose yourself long enough. Countless people die in their sleep every year from carbon monoxide poisoning. Don’t be a statistic. Common symptoms are: Nausea, dizziness, fainting or death. If you start to feel dizzy or weak, get to fresh air immediately and call 911. Make sure nobody is inside your home if you suspect a carbon monoxide leak. Call for help immediately, but don’t call from inside your home. I recommend the Nest CO + Smoke. It’s the best carbon monoxide detector on the market and it’s packed with many great feature. This is a sophisticated device and brilliantly engineered. CO + Smoke alarm for the 21st century. It talks and can be monitored via your phone. Nest Labs, the manufacturer of this carbon monoxide detector, was founded in 2010 by former Apple engineers Tony Fadell and Matt Rogers. Nest Labs is now a subsidiary of Alphabet Inc. (formerly known as Google). The point being : this is an excellent CO and smoke alarm designed by a group of smart people. Stay connected via your smartphone. Built-in Wi-Fi enables you to be fully updated at all times. It talks: It speaks and will tell you if there’s smoke or CO and tells you where the problem is so you know what to do. Nightly Promise : Nest Protect tests its sensors and batteries constantly and lets you know they’re working with a quick green glow at night. The Split­-Spectrum Sensor looks for both fast and slow-­burning fires. Voice alarms with custom location. Phone alerts include:Low-battery, Smoke, Carbon monoxide, Sensor failure. The generator must be installed and operated outdoors only. NEVER install the generator where exhaust fumes could seep inside or be drawn into a potentially occupied building through windows, air intake vents or other openings. Avoid breathing exhaust fumes when near an operating generator. NEVER alter or add to the exhaust system or do anything that might render the system unsafe or in noncompliance with applicable codes, standards, laws and regulations. Install a battery-operated carbon monoxide detector on each level of any building adjacent to the generator following the manufacturer’s instructions. Learn more by reading our in-depth article on carbon monoxide or visit the Center for Disease Control and Prevention (CDC), and read their answers to common questions (FAQ) on carbon monoxide poisoning.